Raaga.com: Now E-Learn dancing at Madhuri Dixit’s Dancing Tutorial Website! Now E-Learn dancing at Madhuri Dixit’s Dancing Tutorial Website! 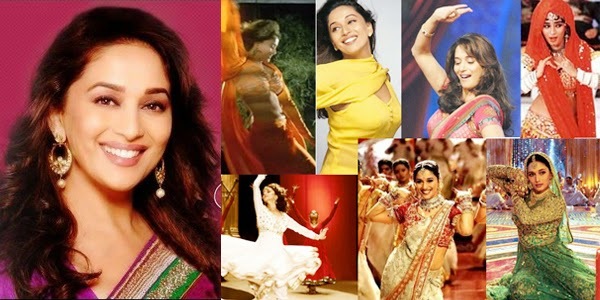 Better recognized as the ‘Dhak Dhak Girl’ Madhuri Dixit is still the heartthrob of her fans, more particularly for her mesmerizing dance numbers like ‘Ek Do Teen…’ (TEZAB), ‘Dhak Dhak Karne Laga….’ (BETA) and ‘Dola Re Dola….’ (DEVDAS). On her 48 birthday Raaga.Com wishes her birthday greeting and pray she continues to be an inspiration for others dancers and become instrumental in making dance thrive in India because Madhuri Dixit and Dance have become synonymous! After becoming a darling of young dancers thanks to her return on TV reality dance show JHALAK DIKHLAA JAA and doing a movie on dance Yash Raj film's AAJA NACHALE; Madhuri Dixit has dedicated her life for dance and is promoting it wide and far as she did by promoting the dance workshop- JUGNEE- organized by Terence Lewis to commemorate World Dance Day. On her 48th birthday she has taken a step forward in her mission of taking dance ahead by launching E-Tutorial Dancing Class called ‘Dance with Madhuri’ Version 2.0, a dancing tutorial website. Her husband Dr Sriram Nene was also present at the event along with director Subhash Ghai, ace choreographers Saroj Khan and Terence Lewis, actor Jackie Shroff and others. Speaking on the occasion Ms. Dixit said, “I have worked with Sarojji, Terence, Maharaj (Pandit Birju Maharaj), the art that these dance guru have is achieved by pure dedication and it comes once in a millennium. I wish to take dance at every doorstep. I am very excited about ‘Dance with Madhuri’,” she said. The Mobile Apparatus has lessons crafted to detail by dancing gurus like Pt Birju Maharaj, Saroj Khan, Terence Lewis, Remo and others. “Through this we are making people learn dance in their own comfort zone. We want to encourage users to dance to stay fit,” Madhuri added.